Brian Irvine believes his former club Aberdeen can win the Scottish Premiership title this season. 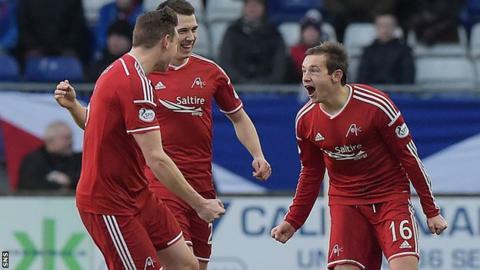 The Dons are just two points behind leaders Celtic after beating Inverness Caledonian Thistle 1-0 on Sunday. And Irvine reckons Derek McInnes' team can become the first side outwith Celtic or Rangers to win the top-flight title since the Dons did it in 1985. "They have genuine hopes of success, not just in the League Cup, but in the Premiership as well," Irvine said. Former defender Irvine played for the Pittodrie men for 12 years from 1985-1997, and he sees no reason why the club cannot finish above champions Celtic this term. The Dons closed the gap on the leaders following Celtic's 0-0 draw with Ross County on Saturday, but boss McInnes did play down their title chances. "Only being two points off the top of the table, Aberdeen have got a realistic chance," Irvine added. "The manager will quite rightly not say that just now, but Aberdeen have a realistic chance of winning the title this season, so it's fantastic to be an Aberdeen fan just now. "It's 30 years since anybody outwith the Old Firm has won the top league and the last team to do that was Aberdeen in 1985, so it would be a good year to do it in 2015, if come the end of the season Aberdeen are top of the league. "I watched the game between Celtic and Ross County on Saturday and Celtic were very very poor on the day. There's nothing to fear. "In previous years Celtic, and Rangers when they were in the Premier League, were teams that other sides feared but now you don't have that. There's a realistic chance that a team like Aberdeen, Dundee United even, can go for it this season." Having recently cleared their bank debt and signed up Niall McGinn and Adam Rooney on new contracts, Aberdeen have been further boosted by securing Jonny Hayes and Andrew Considine on new deals. "It's fantastic for Aberdeen, they're doing so well just now and it's more good news," Irvine added. "Andy Considine is such a vital part of a back four that haven't lost many goals in recent weeks. A player Like Jonny Hayes creates chances by going past players and pulling players out of position, so these are fantastic signings."